My original plan for this month's post was to make a coat from this beautiful gray heavy weight wool suiting, but when the fabric arrived in my hot little hands it started singing to me sweetly of all the sheath dresses I've always dreamed about and well, it was all over with then and there. It had to be a sheath. I have always wanted a fitted sheath TNT pattern for such a long time and this really was the perfect opportunity to finally make one. The wool itself is so gorgeous, it does indeed feel like wool, meaning a bit scratchy, but the texture of this wool is sooooooooo nice, I mean I feel fortunate to have worked with it. It doesn't unravel with handling like some wools or tweeds. And it almost has a bit of sponginess to it and when pressed with the iron it is soooooo well behaved. This dress came on the heals of finishing two velveteen dresses for my daughters- velveteen can be a real pill- so I was so glad when I started working with this wool and it did exactly what I told it to do! Balancing on a rock in heels is tricky! When I began thinking toward making a sheath dress design I looked to J.Crew for inspiration since I love their "Wear to Work" outfits, they are usually pretty timeless. Right away I noticed this image and loved the leopard print belt paired with the simple gray sheath. I studied the lines of different gray sheath dresses and found such great inspiration from this, this, and this image just to name a few! 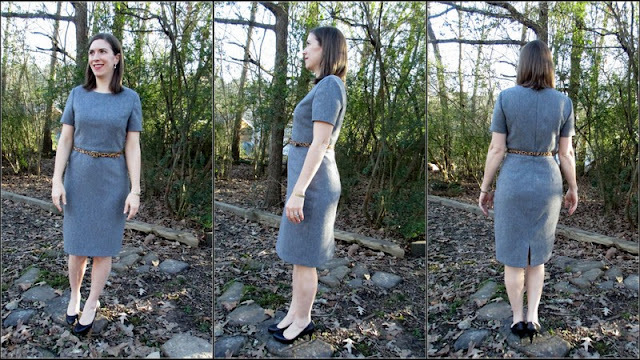 Once I started searching for wool sheath dress images I couldn't stop and I found a great round up of ways to style a sheath at this blog. But I really wanted a leopard print belt and couldn't seem to find one anywhere, I decided I would have to make my own when I ran into a discount bargain basement type store and low and behold, a leopard print belt for $1.00. Gotta love bargain basement stores! I think in the future- when it's really cold- I will try styling it with a button down underneath and a blazer. I read somewhere that a good sheath is a great base garment to build upon with accessories and jackets. I agree! I am already thinking up the necklaces and jackets this dress needs. And I might just need another pair of cute heels, especially if I can find leopard print heels! I used Butterick 5947 and I think this is a great starting place for a sheath. The princess seams make the fitting so much less painful than darts. And the fit for me was pretty great out of the envelope, I was amazed that I didn't have to make any adjustments to the back of the bodice. One small regret is that I did not take the time to adjust the slit at the back and turn it into a proper vent- next time! I do highly recommend this pattern and now have a TNT sheath in my possession- yippee! 1. After reading a couple of reviews of this pattern on Pattern Review and trying on the muslin, I decided to lower the center front neckline by 5/8 inch at the center front narrowing out to nothing before the shoulder. 2. I also made a small narrow shoulder adjustment shaving 1/4 inch from each shoulder, I think next time I will shave off 3/8 inch. 3. I took up about an extra 1/4 inch under the bust point for a little more definition there. 4. I made my usual size 10 at the bust, 12 at the waist and 14 for the roundest part of my hips. I ended up pinching more out around the waistline and eliminating the front skirt darts. I eased in the fullness of the darts and it worked beautifully with this fabric- it was a very well behaved fabric! 5. And finally I raised the waistline on the bodice only by an extra 1/4 inch so stitching line on the bodice was at 7/8 in. I used a couple of "new to me" techniques during construction of my sheath. For the first time ever I used tailor's tacks to properly mark my fabric and they worked beautifully. If this is a "new to you" technique for you I recommend this article at Craftsy. They are great to use for a fabric you either can't mark up or don't want to risk marking up. I also used Hong Kong Seams to finish the armscye on both the arms and as far as references for instructions on this method I search old forums on Pattern Review and found a helpful tip that suggested you stitch the bias tape down one side of the edge you are finishing and hand stitch the other side of the tape enclosing the seam.Here is a Craftsy article on the subject of Hong Kong seams. I made mine using soft me-made bias tape from my stash. For my first time using this finish, I didn't find it all that tedious, and it is well worth it not to have scratchy armscyes. The pattern did not call for an invisible zipper but I used one since I think they give the nicest finish. I hand stitched the lining to the zipper after installation and I hand stitched the hem, the stitches sank into the wool and are undetectable. The pattern did not give instructions for lining the sleeves or the skirt but I wanted a full lining so I just went my own way and used a bemberg rayon lining from my stash. If you are fairly new to sewing I would suggest buying a dress pattern that includes instructions for a full lining and use that to guide your lining process or this book is a great reference for all things lining. I love that this dress will be a perfect base for all jackets and new shoes that I (must) might happen to purchase in the near future! And now I am envisioning this dress in a great floral sateen with piping at the waistline or color blocked like this one! One of my favorite parts of the sewing process is dreaming up the possibilities of a pattern and knowing that a particular pattern will give me good results. I am so happy with this sheath and the wool feels so luxurious. It is a bit thicker than other wool suitings I've used but it is not so thick that you have to worry about super bulky seams and as I've stated earlier the fabric is soooo well behaved that when you hit it with the iron it lays right down and no worry of marking it up with the iron either. Happy wool sewing to you and may all your wools behave as kindly as this one! One more quick note, maybe you are curious like me and have always wondered just what comes to you in one of those great Fabric Mart fabric bundles. I finally ordered one (I know what was I waiting for?) and received it and wanted to share with you a picture of all that was included. I ordered two 10 yard bundles and these are the fabrics that came to me. I had such a great time going through them and planning what I will make with them and my daughters instantly claimed the sparkly green knit for mermaid tails! Clockwise from top, there are two silks, a sparkly brown sweater knit, a heavy satin (will be a great coat lining), a nice satin with stretch, a striped ITY, a colorful ITY, a royal blue knit that is thin and I think will work as a great knit lining, an off white knit, and green mermaid tail knit with sufficient sparkle for a 3 and 7 year old! The perfect sheath dress it is!!!! You look amazing. 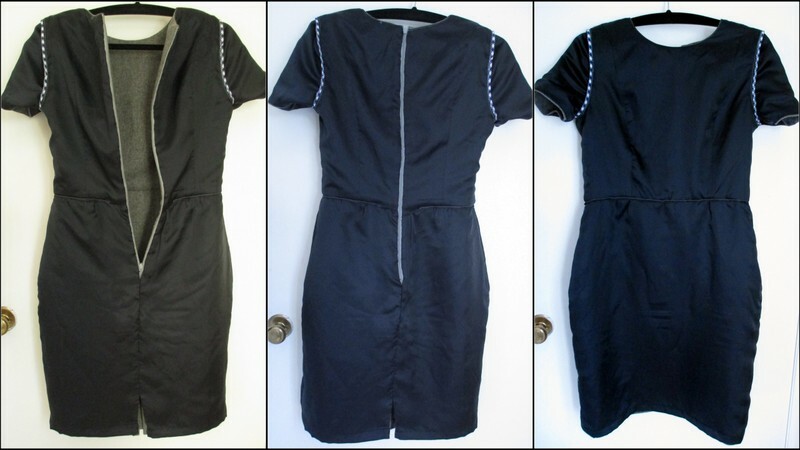 A dress that can be worn to the office, church, and date nights!! Your sewing skills are top notch. Thank you so much for your kind and encouraging words! I was going for an "all occasion" type dress, and in fact I wore it last weekend to church!